It makes for a good story. Back in the early 1950s men in Hillsborough, North Carolina, could see stockcar races for free. Why buy a ticket when you had a free seat in the air. All they had to do was shimmy up a tree edging a fence at the second turn and they had a grand view of the .9-mile dirt oval. That plan carried a bit of risk but all was fine as long as the drivers didn’t spin out. Then the inevitable happened. Fireball Roberts lost control in turn two one day and smacked a tree hard. Men came tumbling down. It was raining men as the disco song went. How this horse track became a stockcar track makes for a good story too. The track’s roots literally reach—not into the earth—but into the air. In 1947, NASCAR’s founder, Bill France Sr. was flying over Orange County, North Carolina when he spotted a horse racetrack one General Julian Carr owned. France made the General an offer he couldn’t refuse, bought the racetrack and prepared it for NASCAR’s inaugural season in 1949. Over the next twenty years, NASCAR’s drivers raced against one another on the dirt track. Fonty Flock, Curtis Turner, Herb Thomas, Bill Blair, Jimmie Lewallen, Fireball Roberts, Tim Flock, Joe Weatherly, Cotton Owens, Ned Jarrett, and Richard Petty duked it out. Though prize money was meager something grand happened: the thrilling spectacle and tradition we know as NASCAR was born. Tens of thousands of fans came to Hillsborough over a 20-year period. “Big Bill” as France was known was thrilled … for a while. Problems, minor and major, began to surface. Fans found ways to enter the track without paying. Some climbed trees. Others crossed the adjacent Eno River and sneaked in. Meanwhile a problem bigger than freeloading fans was brewing. Drivers loved the track. Most had never raced on a track that was bigger than a half a mile. For all practical purposes, it was NASCAR’s first super speedway. Things were speeding along you could say when clergymen pressured local government to outlaw racing on Sundays. That literally put the brakes to NASCAR’s first big speedway. In 1968, Richard Petty won the last race held at the Orange Speedway, its new name, for a stint, but then nature began reclaiming what had been hers. She’s still working on it. The track is silent today. Its dirt oval is narrow and overrun with trees but history is alive and well here. 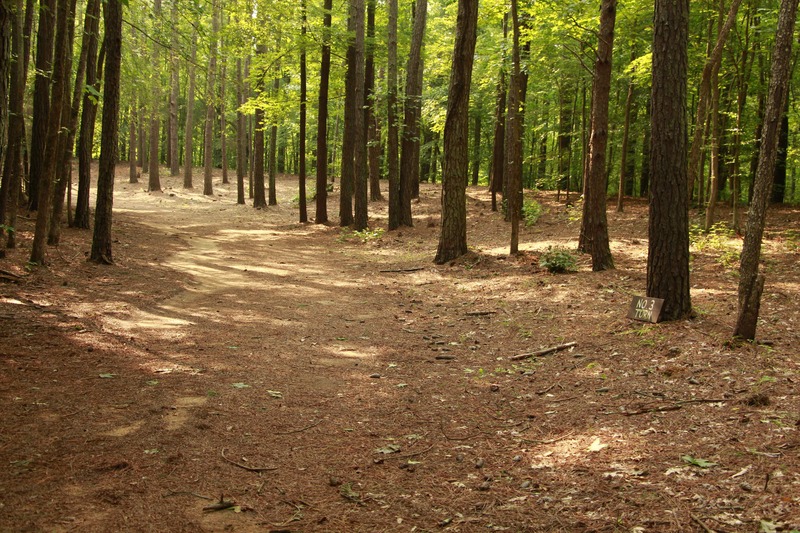 The Historic Occoneechee Speedway Trail is a 44-acre site on the National Register of Historic Places. 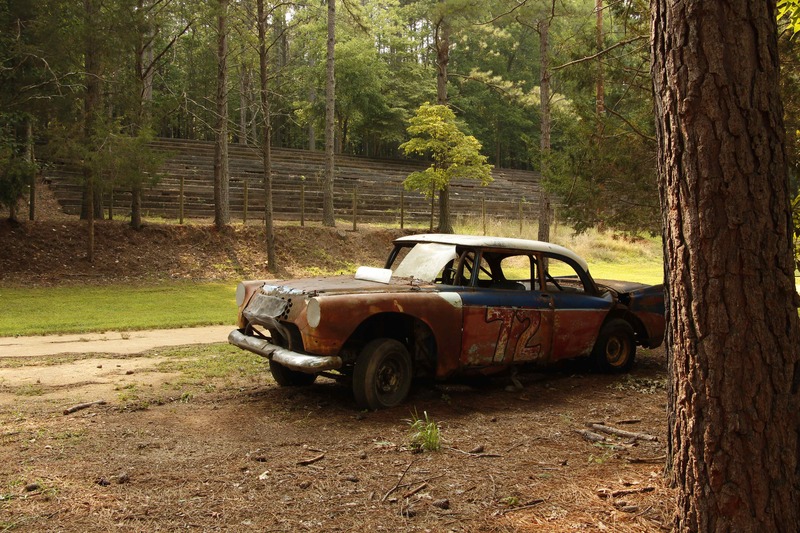 You can walk three miles of trails takes along the banks of the Eno River, and you can walk around the sole surviving speedway from NASCAR’s inaugural 1949 season. For two decades, the speedway enjoyed fame. From 1948 to 1968, it pulled in the best stock car drivers and thousands of spectators. Among the racers were legends in the making: Richard Petty, Bobby Allison, Bobby Isaac, David Pearson, Curtis Turner, Buddy Baker, and NASCAR’s first superstar, Fireball Roberts. Some nicknames prove sadly prophetic. Edward Glenn “Fireball” Roberts, tragically nicknamed, died July 2, 1964 as a result of a flaming wreck at the World 600 in Charlotte May 24, 1964. I recall listening to NASCAR races with Dad on Sunday afternoons and I remember when Roberts died. I can’t recall but am sure I listened to some of the races at Occoneechee. I want to say that we heard those legends roaring by thanks to the miracle Marconi gave us. I intend to go back. 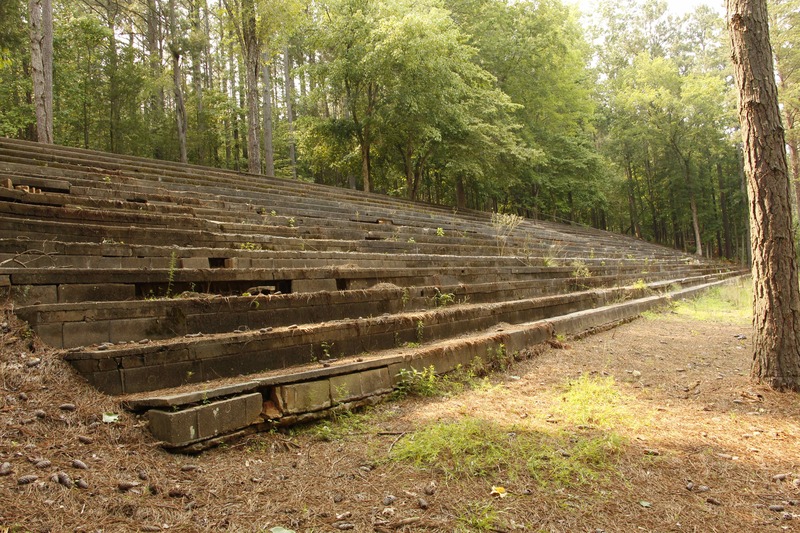 It’s a long drive so you may choose to ignore this old lonely track, but if you appreciate NASCAR’s history, you owe it to yourself to see the abandoned Occoneechee Speedway in Hillsborough, North Carolina. I visited it July 1, a steamy day threatening rain. The track’s ghostly presence sent me way back to the Sundays when Dad and I followed King Richard on the radio. Appropriately enough, The Hillsboro 150 was the 43rd race of the 1968 NASCAR Cup Series season and it took place at Occoneechee Speedway September 15, 1968. Richard Petty won it in his 1968 Plymouth from his number one starting position with an average speed of 87.681 mph. He outran twenty-three drivers. The King raced 150 miles, taking home $1,600 of the total prize purse of $6,900. Walking the back straightaway, I thought of all the cars down shifting as they approached turns three and four. The only traffic on the track now are joggers, walkers, and people walking dogs that pee and, well, you know, where brightly colored cars roared through. Occoneechee Speedway, one of the first two NASCAR tracks to open, is the only track remaining from the inaugural 1949 season. The site is thick with 47-year-old pines and sycamores. Parts of the infield look like a grassy plain. The cement grandstand overlooking where legends Fireball Roberts, Richard Petty, and Ned Jarrett went round and round still stands. A pipe exits the ground in the infield and just hangs there rusting. France wanted to build a super speedway here but a local fellow told me seven little church ladies, not clergymen, fought France hard. Racing, they said, was too noisy for the Lord’s Day. France moved on and built a racetrack in a place called Talladega. NASCAR grew into a huge sport and Petty and other drivers mentioned became legends, setting the stage for big-time stock car racing. Maybe things worked out as they should. “Hillsborough” doesn’t sound like racing. “Talladega” does. Before I left that hot and humid July day I stood on the old cement grandstand right across from the finish line. It would have been a fine place where Dad and I could have seen the electric-blue No. 43 take the black-and-white-checked flag. Well, I take heart in thinking that we heard it at least. Occoneechee Speedway, you should know, is one of just three racetracks on the National Register of Historic Places.